Working local, seasonal foods into your diet is an easy and delicious way to reduce your carbon footprint. The average food item travels 1,500 miles to get to your plate. Local food uses far less gas to get from farm to table. On top of that, local food is usually fresher than something that’s traveled a long time and distance. If you hit your average grocery store chain it seems nearly impossible to stock up on local eats. With a few handy resources, though, it’s as easy as (organic, locally-grown apple) pie! We’ve talked some about getting that Fall garden going. Home grown food is not only good for the earth; there is nothing more satisfying than eating a meal cooked with foods you grew and harvested yourself. Of course, a full-scale garden isn’t an option for everyone. 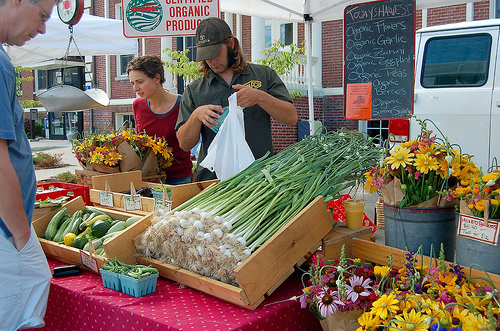 Local Harvest is a fantastic resource for finding farmers markets, co-ops, small farms, and even online stores for purchasing local, organic produce. There is a search tool right on their main page that allows you to find what you’re looking for by zip code. You can even enter a particular product you’re looking to find! On top of your standard fruits, veggies, meat, and dairy they can help you track down locally-made specialty products like flowers and yarn! OK, so you’ve harvested your garden, hit up that farmers market, and you’re ready to cook. Now what? There are a couple of online recipe tools you can use. Epicurious has a nifty interactive tool for finding seasonal ingredients. Not only will it give you a list of ingredients by month and state, it links to recipes, cooking tips, and ingredient descriptions. While it doesn’t focus on local food, Allrecipes has an recipe search where you can enter up to four ingredients you want to use and four you don’t. This comes in especially handy if you pick something up that you’re not used to cooking. Eating more seasonal foods doesn’t have to mean being deprived later in the year when there are fewer things growing. You can stock up on, say, tomatoes, while they’re in season and preserve those suckers by canning them! Eat. Drink. Better. has a great writeup of good canning practices and how to can food safely. With so many online tools for finding local food and recipes using local ingredients, eating local is easier now than ever before.